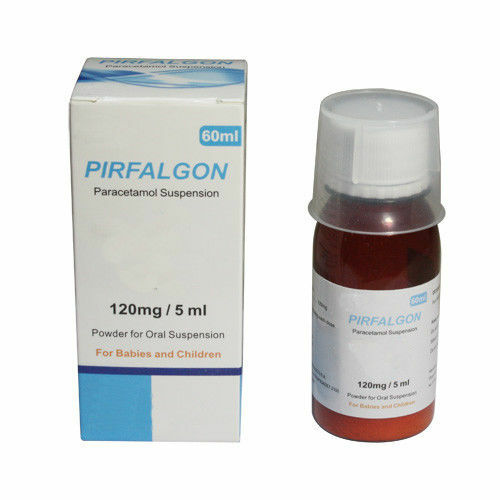 Each 5ml of oral suspension contains 250mg of paracetamol. The product is packaged in amber Type III glass bottles with high density polypropylene child resistant tamper evident caps with polyethylene liners, in pack sizes of 100ml and 200ml of oral suspension. The bottles are packed with a spoon with a 2.5ml and 5ml measure and Patient Information Leaflets into cardboard outer cartons. Acetaminophen is thought to act primarily in the CNS, increasing the pain threshold by inhibiting both isoforms of cyclooxygenase, COX-1, COX-2, and COX-3 enzymes involved in prostaglandin (PG) synthesis. Unlike NSAIDs, acetaminophen does not inhibit cyclooxygenase in peripheral tissues and, thus, has no peripheral anti-inflammatory affects. While aspirin acts as an irreversible inhibitor of COX and directly blocks the enzyme's active site, studies have found that acetaminophen indirectly blocks COX, and that this blockade is ineffective in the presence of peroxides. This might explain why acetaminophen is effective in the central nervous system and in endothelial cells but not in platelets and immune cells which have high levels of peroxides. Studies also report data suggesting that acetaminophen selectively blocks a variant of the COX enzyme that is different from the known variants COX-1 and COX-2. This enzyme is now referred to as COX-3. Its exact mechanism of action is still poorly understood, but future research may provide further insight into how it works. The antipyretic properties of acetaminophen are likely due to direct effects on the heat-regulating centres of the hypothalamus resulting in peripheral vasodilation, sweating and hence heat dissipation.